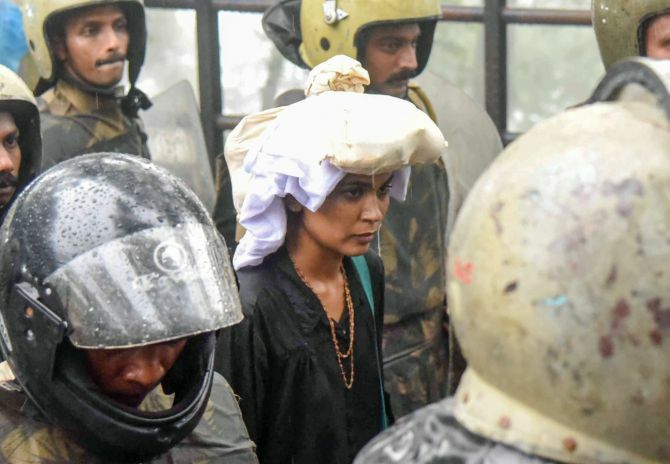 Ending hours-long drama and tense moments at Sabarimala, two women reached the hilltop on Friday but had to return before reaching the sanctum sanctorum following massive protests by Lord Ayyappa devotees. The women were identified as a reporter from Hyderabad in her late 20s and an activist from Kerala. The devotees, including senior citizens and children, protested against the entry of women of menstrual age group into the hill shrine. Tension was defused after the women agreed to return as the state government made it clear it did not want to take them to the Sannidhanam, the temple complex, by using force against the protesting devotees. The firm stand taken by the 'tantri' (head priest) that he would close the temple if the women were escorted into the sanctum sanctorum also persuaded them to return as per instructions of the police. Though the women had earlier insisted they should reach the shrine, police later convinced them about the gravity of the situation and conveyed the stand taken by the government and th head priest. If they had reached the shrine, they would have been the first women from the menstruating age group to visit the Lord Ayyappa temple at Sabarimala after the Supreme Court order permitting women of all age groups to enter the shrine. 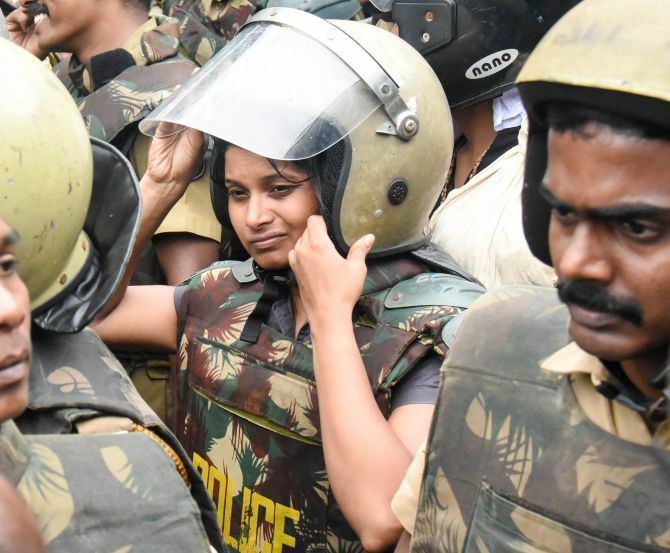 Inspector General S Sreejith, who led the police team escorting the women, later told reporters the women have expressed their willingness to go back. "The tantri has informed me that he will close the temple and go if the women enter the shrine complex. It was conveyed to the women and they have expressed their willingness to go back. We will give them protection in the same manner to climb down the hills," he said. Devotees received his announcement with thunderous chanting of 'Swamiye Saranam Ayyappa'. the holy steps and protested against taking the women to the shrine complex. As the situation appeared to be going out of control with the protesters blocking the way sitting on the floor, Sreejith told them they were only implementing the law but there was no plan to go forward by hurting their sentiments. State Devaswom Minister Kadakampally Surendran, who was in the state capital, told mediapersons that the government was not ready to use force and hurt the sentiments of devotees. He also said that one of the women was later identified as an activist and holy Sabarimala was not a place to show their strength and activism. "The government has the duty and responsibility to implement the Supreme Court order and give protection to devotees but not for activists," Surendran said. "Police should have examined the veracity and background of the women who came to trek to the shrine," the minister added. Madhavi, a devotee from Andhra Pradesh, and a New Delhi-based woman journalist were also forced to return following intense protests by devotees in the past two days. Kerala has been witnessing massive protests by Lord Ayyappa devotees opposing the entry of girls and women of menstrual age into the Sabarimala temple since the government decided to implement the apex court order. The devotees had intensified the agitation at the shrine complex and nearby areas including the base camps, Nilackal and Pamba, since the shrine was opened for the five-day monthly puja on October 17.